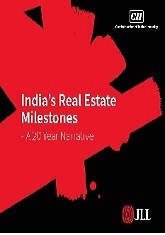 This report prepared jointly by CII and JLL on the Realty Sector features top 20 milestones over the past two decades, which have been the course changers for Indian real estate. It also highlights future trends and opportunities leading to an exciting new phase of growth in 2018. The report says that the sector is on a ‘path of revival’. It was unveiled at the CII Realty and Infrastructure National Conclave held on 9 August 2018 in Mumbai.